The other day at IFBcon, I asked Phil Oh of Street Peeper where the line is between paparazzi and street style photographers like him. He laughed and told me that he feels like a paparazzi much of the time. It's no surprise. Like paparazzi, street style photographers hang out outside big New York events, wait for style icons to step out of their cabs, and then swarm around them like angry bees. "Turn around, Miroslava!" they shout. "Pose for me just one more time, Michelle!" They're more polite than paparazzi, no doubt, often say "thank you" after their shots, quite often, in fact, have personal relationships with the people they shoot. I saw, for instance, Eddie Newton hold a woman's hand to help her over a snow bank yesterday right after taking a picture of her. But, no doubt, street style photographers often lend the same sense of menace to the fleeing fashionista, attempting to escape a runway event unseen. The scene outside Milk Studios felt so seedy yesterday I just had to leave. I felt dirty. Exploitative. A hunter tracking his prey. So I wasn't too surprised when Miroslava Duma stomped by with a grimace on her face outside Thakoon. There are just so many photographers out there these days. It's overwhelming. And even street style darlings get photo fatigue sometimes. 11am - Hit up Milk Studios for something or other on a tip from Big Rube of Street Gazing. Couldn't figure out what was happening there. Left. Got one cool shot of some dude with gold teeth on the way out. Noon(ish) - Up the street 12 (or so) blocks to catch the crowd exiting Derek Lam. Scott Schuman was there, along with Phil Oh, Tommy Ton, Eddie Newton, and (gasp) Bill Cunningham, so we knew it was the place to be. 1pm - Headed down the street another ten blocks for the crowd outside DKNY. Lots of photogs, but not much to shoot. 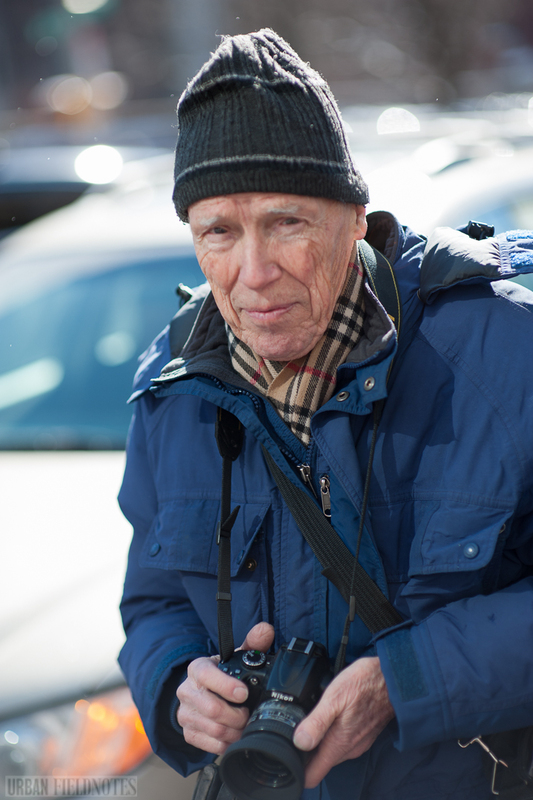 Took more shots of Bill Cunningham. 1:30ish - Moved over to the corner of 26th and 11th, where Adam Katz Sinding, Youngjun Koo, Eddie Newton, Wataru Bob Shimosoto, all photographers whose work I admire, were attempting to get exclusive pics of editors exiting cabs. Didn't pan out. But I had a nice conversation with Adam Katz Sinding. He has left his job as a concierge at the W Hotel since I interviewed him back in July. It was getting in the way of his shooting schedule. Plus, he figured out he could make more money without actually "working." Got tips from him on where to go next and followed them. The cool kid photogs, outside Thakoon. 3pm - Up the street a couple of blocks to catch the crowd at Thakoon. Adam (the guy with the beard in the picture up top), Youngjun, Wataru and the other cool kid photogs were there. So was Yvan "Facehunter" Rodic. Once again, we figured we were in the right place, and were rewarded with pics of Miroslave Duma (above), Bryanboy, Michelle Harper (below), Susie Lau, and others. Most of mine were not good enough to post. I suspect some of the more experienced photogs had better luck. 3:45pm - Dashed up to Lincoln Center to shoot those heading in to Diane Van Furstenberg. The scene was swarming with photographers and posing fashionistas. I had more or less lost interest in shooting by this point. 4:25pm - Back to Penn Station to catch the train home, exhausted. Kept shooting pictures in my head all night long. So what did I learn yesterday? Well, for one thing, street style photography — at least at Fashion Weeks — is a game of cat and mouse. Photographers chase down the style stars. The style stars pretend they don't want to be photographed, but pose anyway. Photographers then move on to the next venue. I also learned that the line between paparazzi and street style photographers is getting blurrier all the time. The street style set dress better, clearly. The "actual" paparazzi I've encountered so far tend to be schlubby middle-aged men in puffy black coats. There are few Doc Martens or designer trench coats among them. Their facial hair is not nearly so intricate. And they have little interest in shooting fashion editors or models. The other day, shooting at the backstage entrance to Lincoln Center, I heard one paparazzo talking on the phone. "No," he said, a hint of irritation to his voice," it's all just models here." Photographer or stylista? Blogging all but eliminates that distinction. Street style photographers also take more pride in the artistic craft of their photography. Their idols are Amy Arbus and Eugène Atget, not the staff from TMZ. They try to flatter their subjects with their pictures, capture them looking chic and mysterious. They try to instill in their subjects a kind of distanced, unapproachable glamor. And it is obvious looking at their photos that the aesthetics of them are valued at a premium. It's not just about getting a clear shot of a celebrity (and the non-fashion variety hold little interest for them anyway). It's about capturing something of the essence of that style star. They do portraits, not snapshots, per se. That's why they use portrait lenses instead of the paparazzi's telephotos, max out the background blur by opening up the aperture to extremes. Nonetheless, street style photography as a practice has a good deal in common with paparazzi activity. And it can feel just as morally ambiguous. Today, I've got a street style hangover. I'm a little bit dehydrated. A little bit worn out. And a little bit grossed out by my day of chasing the stars. I'm looking forward, I have to admit, to getting back on the streets of Philly shooting ordinary people with an interesting look. But that's days from now. Tomorrow I'm heading back out on the means streets of NYFW to get some awesome shots of some over-the-top fashionistas. I'm looking forward to it too, in spite of myself. wow, I am learning something!! I'm far away from NYFW, unfortunately. However, thank you for getting specific on the differences (sometimes) between paparazzi vs. street style photographers. Call me dumb but I didn't even know that there were famous street style photogs who do this for a living. But, I love street style photography, and look forward to more. Thanks! Adam Katz Singding is such a great photographer! I didn't know he was a concierge, that's pretty impressive in New York! I can't believe you got to see Bill Cunningham! He's like my life crush. Were you able to talk to him at all? I would have been just thrilled to get that shot of Bill Cunningham (My Hero!). I love Michelle Harper's style. Street Style photography has become more competitive with all of the street style blogs out there jockeying for readers, and only so many stylish subjects to go around. How do you do this and stay so chill?! I couldn't be a street style photographer, I'd be such a fan girl! I think you made a great point that street style photogs try to FLATTER their subjects. The shots on blogs are so much more artistic than in the tabloids.